Have you ever been to or heard of this unique tomb right here in Lahore which is known as “Cypress Tomb” or Saru wala Maqbara. Well, my dear readers this tomb is an early 18th century tomb located in Begumpura. The Cypress Tomb is in close vicinity of the Gulabi Bagh and is located about 200 meters north of Dai Anga’s tomb on Grand Trunk Road known as GT Road. It is not accessible easily due to the various buildings which have been constructed in the area and I think most of our monuments have been damaged due to encroachments and heavy constructions around them. Once you reach this place you can ask anyone about it and you can make your way to the monument by walk or car. Historians say that once this tomb was inside a grand garden but with the passage of time and sheer negligence towards such monuments the encroachments and constructions began and there was no action to stop them. Thus the garden was lost and most of the gardens were damaged during the British Raj as well when they were constructing the Railway Lines and redeveloping the city. You must be thinking about its name, well, Saru or Cypress is a conifer (a cone bearing tree) of northern temperate regions and are also found in dry areas and are frequently planted as ornamental trees. Well this tomb or area around the tomb does not have these trees but the strange fact is that it is decorated with the motifs of these trees. With those motifs it got popular as Cypress Tomb and until now it is known by the same name, but there is another fact that many of us do not know about it. It’s a lost heritage I guess and should be made popular. Who is buried in this tomb is another question as most of the people are unaware of this monument in Lahore? This is the tomb of Sharf-un-Nisa Begum. She was the sister of Nawab Zakariya Khan, Governor of Lahore during the reign of Emperor Mohammad Shah, popularly known as Muhammad Shah Rangila.. If we get into the history of this place it is said that originally the structure was constructed to meet the requirements of Sharf-un-Nisa Begum’s as she daily visited the first floor chamber which is 16 feet above the ground level. It is said that this was the meditation chamber of Sharf-un-Nisa during her lifetime. This conical tower with a pyramidal vault was built by Sharf-un-Nisa herself as an isolated place to avoid the politics of the rulers of Lahore, which were at peak in those days. She spent most of her time there reading Holy Quran and after reading she would place the holy book as well as her jeweled sword. She would climb to this room by means of a wooden ladder and after she would leave the place the ladder was removed. After her death she was buried in the same chamber which is 16 feet above the ground level, along with a copy of the holy book and her jeweled sword. Respecting her wishes to keep her mortal remains out of sight and inaccessible, all openings were blocked up, providing a blank appearance in the battered walls on all four sides. Here it is worth thinking that why Sharf-un-Nisa Begum the sister of the ruler of Lahore spent her time away from the fort and her brother. The two famous historians have same reasons to this question. Kanhaiya Lal and historian S M Latif both narrate that Sharf-un-Nisa Begum had some disagreements over various issues with her brother and thus she spent time in isolation. The historians say that the tower was built during 1735-1740. It is popularly known as Saru wala Maqbara because of ornamentation of cypress trees rendered in square ceramic tiles, rather than the tile mosaic as seen in Gulabi Bagh Gateway. Cypress Tree tiles are not found in any other monument in the city and that is the reason of this monument being unique. They are still in good condition which tells that they were of excellent quality. The tower like form, sporting slightly battered walls, is exclusive in itself. The tomb for its unusual shape and facade decoration of cypress motif is considered to be the jewel of Mughal architecture at Lahore. This jewel of Mughal era could not escape from the vandalism of the following rules. Like many other Mughal era Monuments, the tomb became the victim of the destruction carried out during the 18th century Sikh rule. Historians write that the Sikhs looted this building as it had precious jewels inside it. There is an interesting myth by the locals that when the Sikhs were looting the place their ladder always fell when they attempted to reach the tomb chamber and they left after trying hard. The tomb is square in plan and the chamber is covered by a single dome of a four-sided pyramidal shape. The drum has a low neck. 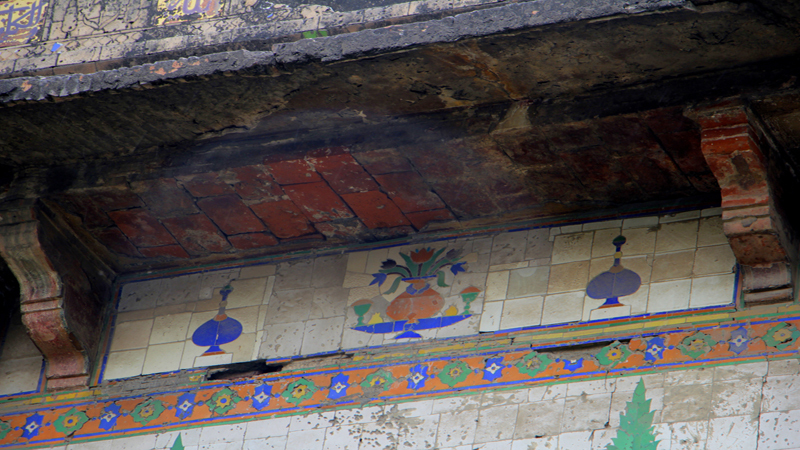 A band of color glazed tiles runs around the neck of the dome. It is embellished with the attributes of Allah in superb calligraphy. The burial chamber can only be approached by the use of a moveable ladder as there are no other stairs to lead there. The idea behind such structure is that even the grave of the ‘purdah’ observing lady should be kept out of the view of public. The low pitched four-sided pyramidal dome, over a double drum, is a unique feature of this tomb. The dome is covered with glazed tiles in blue and white colors finished in zigzag patterns. Now come to the exterior of the tomb, which is embellished with colorful cypress trees. 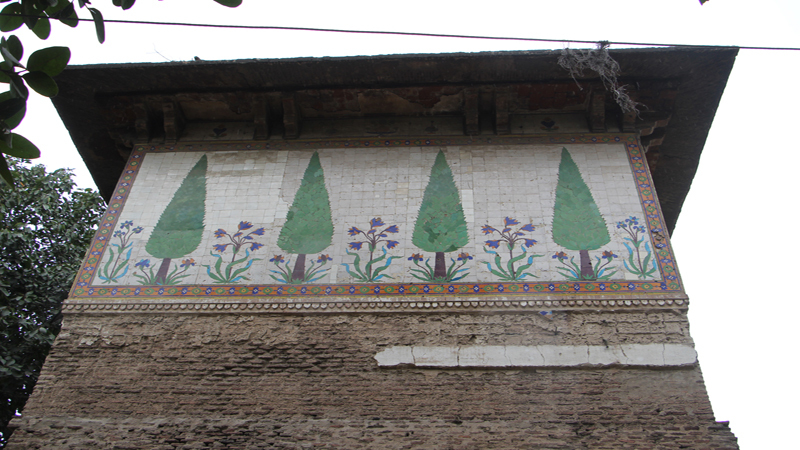 These cypresses, four on each side, are intercepted by little blooming flower plants, all in enameled square tile mosaic work on the plaster base. It was claimed by some people that those tiles were imported but later many historians proved that the tiles were manufactured here. Historian Catherine Blanshard Asher describes the tomb as “Lahore’s best monument from the post-Aurangzeb period”. It is a “unique structure” as it is like a tapering tower with a “pyramidal vault”. 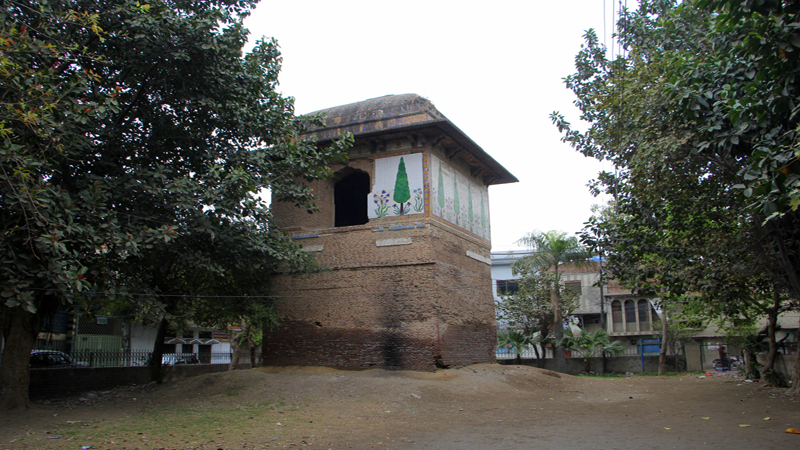 The tomb is listed as a protected monument by the Archaeology Department of Punjab and they have recently restored it. Previously the entire monument was getting derelict and the bricks were also falling apart and the ornamentation was fading away. I am glad that the monument is restored now and fenced so that the locals do not damage it. In my opinion, this place should be well maintained now and turned into a tourist spot and tourist guides should be there to educate people about it. If the tomb remains like this, away from people, the masses will never know about its importance and historic value.